Camu Camu is an antioxidant-rich fruit that comes directly from the Peruvian Amazon. It is one of the world’s most powerful fruits because of its high concentration of the antioxidant Vitamin C.
Other traditional uses of Camu Camu are for anti-ageing, mood support, anti-inflammation and to nourish the skin. Our Camu Camu is harvested in the heart of Peru through a GMP certified facility and offers unmatched purity and quality in every bottle. Source of antioxidants for the maintenance of good health. 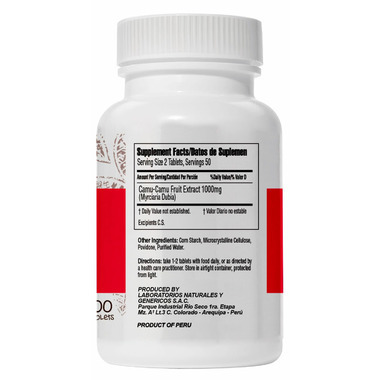 An antioxidant that decreases the adverse effects of free radicals on normal physiological functions and that helps to reduce free radicals and lipid oxidation in body tissues. Adults take 1-2 tablets per day with a meal or as recommended by a healthcare practitioner. 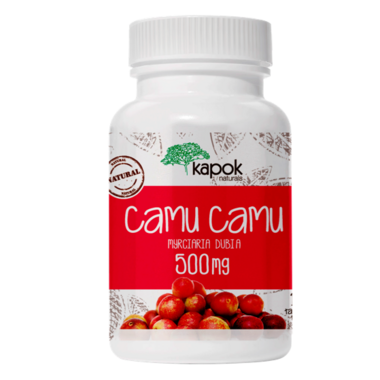 Camu Camu 500mg (Fruit) Extract. Non-Medical Ingredients: alcohol, corn starch, microcrystalline cellulose, povidone, purified water.